Darkenhöld from France have already released their fourth full-length. I admit that I respect the stamina of widely ignored underground formations very much and, honestly speaking, I believe the here presented artists fall into this category. This is a pity, because the courageous dudes are seeking for a distinctive style. 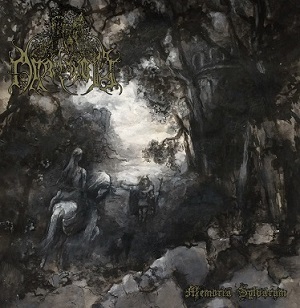 Their quite melodic form of black metal is mixed with Viking choirs that appear from time to time, keyboards also emphasize the atmospheric side of their compositions and soft interludes prevent a harsh overall impression. The record label tells us that "the songs are an ode to the solitary explorations of the forests of South-Eastern France" and it might be this patriotic, naturalist approach that makes me think of Graveland. Yet the songs of Darkenhöld do not have much in common with that of Rob Darken's best tunes create. The hypnotic effect is missing. On a positive note, the album holds songs with a much higher degree of variety. Sometimes this way of proceeding leads to very good results. For example, the multi-layered "A l'orée de l'escalier sylvestre" creates a pretty intensive atmosphere at the end and does not lack speed and intensity. Nevertheless, it is also true that some songs fail to come to the point. They leave a relatively vapid taste, not bad, but, well, vapid. The problem is that the guitar work does not fully convince. A certain number of sequences is going nowhere, and effective riffing is not among the particular strengths of the band. However, inter alia the beginning of "Clameur des falaises" proves evidence that the explorers of the forests are (at least sometimes) definitely able to design a strong maelstrom of metallic guitars. Due to the fact that this track delivers some pretty fast and straight parts as well, I recommend listening to it if one wants to get in touch with this album. The more or less typical lead vocals do not lack currishness or meanness, the production can be described as very solid and all songs reflect a meticulous song-writing process. Nevertheless, the album either lacks density or it is simply not brutal enough. Memoria Sylvarum sounds like the output of a very talented formation which is not able to bundle its strengths in an appropriate manner. That's sad, because the full-length offers many moments that indicate the actually great potential of the artists. The opulent - and very coherent - closer, for instance, turns from a somber part into an unleashed eruption and both sections are impressive. The guitars create a good flow and timpanist give the song a dramatic touch. Therefore, I can only encourage the band to put its harsh side into the focus of their next work while reducing heroic (and pretty annoying) background vocals and emotional sections. At the end, almost everything fits, the stylish artwork, the lyrical concept, the integrity of the musicians - only the music, and that is the tragedy of this release, leaves room for optimization.